Perfect for a family, this villa offers expansive space to relax in comfort in an intimate setting to enjoy the company of your loved ones. The split level home accommodates up to eight guests in four en suite bedrooms with the option of adding two extra cots for children. The villa has a very modern appeal with Balinese-imported furniture, most of which is made from heavy teak wood of the highest quality. Pale colors and decor throughout the home pay tribute to the calmness of the sea-side setting. Through the front door on the main level is a large open-plan living area with a kitchen, living room, and dining area. The kitchen features sparkling granite countertops and maple cabinetry with a breakfast bar and five stools. A full selection of modern appliances allows preparation of a scrumptious family-style meal to be enjoyed alfresco on the dining table on the spacious outdoor balcony. A second indoor dining table is perfect to play board games from the selection available when not lounging on the living room sofa bonding over movie time. To the right of the kitchen is the master suite with a king-size bed and walk-in closet with ample space for multiple suitcases and a variety of outfits. The en suite bathroom comprises a large Jacuzzi and double sinks with tasteful contemporary decor. In the corner of the room is an office desk and out on the private balcony are two rocking chairs looking out to sea. 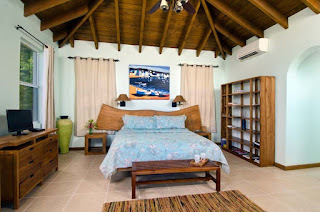 The second bedroom affords a private balcony harboring rocking chairs and a cozy king-size bed. Its en suite bathroom features an intriguing stone sink basin, imported from Bali using their own local granite. On the lower level, two bedrooms each with two twin beds that can be converted into a king, have en suite bathrooms and direct access to the patio and 30-foot pool – ideal for those who enjoy morning laps. This level sits a second outdoor dining table and a gas grill for barbecues. 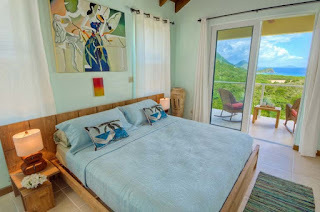 Enjoy the Caribbean breezes with the fully screened floor to ceiling sliding doors, or take advantage of the air-conditioning throughout the villa. Surrounding the property are meticulously maintained gardens with an array of exotic trees including tropical palms, mango, banana, and cedar. Magenta bougainvillea, hibiscus flowers, and ferns are complemented by the multi-toned blue water creating colorful tropical surroundings. 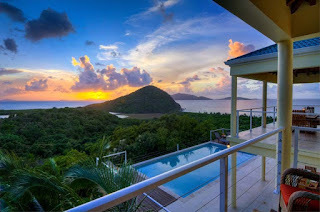 Flamingo Sunset is named after the two most astonishing sights to witness from its pristine location: flamingos in the salt pond below the Belmont Peak, and spectacular sunsets of whipped pink, orange, and purple tones setting between Great Tobago and Jost Van Dyke. Below, Smugglers Cove is a hidden gem – just a five-minute drive away, the white sand beach is a peaceful National Park lined with palm trees and unknown to most visitors. 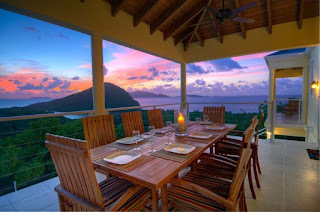 Even closer and visible from the villa is Long Bay beach with a mile-long shore and two dining options. Along the coast heading north, more restaurants can be found at Apple Bay, a local community with a renowned surfing beach and the infamous Bomba Shack, home of the full moon parties. Conveniently located 10 minutes from the home is Soper’s Hole Marina where you will find the West End Ferry Terminal with day trips to Jost Van Dyke, along with a variety of shops, services, and restaurants. 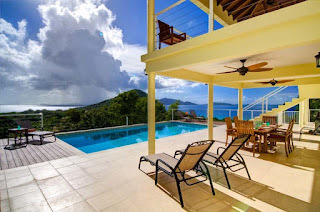 New as a rental to Villas of Tortola’s portfolio, Flamingo Sunset invites you to come, stay, and make yourselves at home.